Compared to the traffic that my online store gets from Google, Bing traffic is pretty much an afterthought. For example, last month my store got 18 times more organic traffic from Google than Bing and an order of magnitude more orders as well. As a result, I’ve never ever paid much attention to Bing. On the flip side, I spend thousands of dollars every month on Google advertising including Google Adwords For Search, Google Display Network and Google Shopping. Anyway early this year, I finally decided to give the number 2 search engine a shot. And it turns out that I’ve been leaving a lot of money on the table by waiting so long. Even though Bing gets significantly less search traffic, the Bing ads platform is awesome from a pure sales and conversion perspective. When I first considered Bing advertising, I debated whether the platform was even worth my time to learn. After all, I spent a lot of time and money learning how to make Google ads profitable. Was it worth spending a similar amount of time to learn a brand new platform that offered 18X less traffic? It turns out that my fears were completely unjustified. Microsoft created the Bing Ads platform to be almost an identical clone of Google Adwords. And I mean completely identical in every way! Every menu looks the same. Every option is almost identical. And the bidding and keyword research works almost exactly the same as well. In fact, they even have a tool that allows you to import your Google Adwords campaigns into Bing verbatim. With just a couple of clicks of the mouse, I instantly imported all of my previous Google ads, ad groups, negative keyword lists….everything within minutes! This made getting started with Bing extremely easy and an ingenious move on Microsoft’s part. Once I imported all of my campaigns from Google, I was very tempted to just start running my Bing ads right away. After all, every campaign appeared to be imported properly and every ad looked pretty much identical when I put it side by side with Google Adwords. But upon closer examination, I’m glad that I took some time to analyze the campaigns closely before activating them. It turns out that Microsoft took a few liberties with my ads that weren’t 100% obvious at first glance and I would have wasted a lot of my money had I not caught it in time. For one thing, the Bing “Content” network is automatically enabled for all ads by default. For those of you who are unfamiliar with the Bing content network, it’s essentially the same as the Google Content Network. Ads are shown on content sites like blogs and other news publications. Users who are reading these publications typically don’t have the intention to buy when they see your ads so it takes a completely different strategy to make these types of ads profitable. If I had enabled my ads on the content network by default, I would have wasted a lot of money right off the bat. The other side effect of using the Bing import tool that I did not appreciate was that it converted my “Modified Broad Matches” into “Broad Matches”. But when converted to broad match, they will match with any search that Bing deems is close enough to “wedding handkerchiefs”. If someone typed in “festive snot rags” for example, it might show my ad. The final change that didn’t convert properly from Adwords to Bing was the geographical targeting of my ads. Because most of my customers are from the United States, I typically only show ads in the US. But by default, Bing ads are shown everywhere. Those minor annoyances aside, I was up and running with my ads within a day. And I thought that I’d also add that Bing support was extremely helpful along the way. There were a few menu items that I did not quite understand and the phone support guys were able to explain things clearly. Also at the time of this writing, the Bing Product Ads documentation was terrible and I had to call support to get a straight answer on their product feed format. Hopefully, they’ll beef up their docs soon. Anyway before I show my results, here’s what industry experts typically say about Bing Ads versus Google ads. Bing ads typically offer cheaper CPCs. 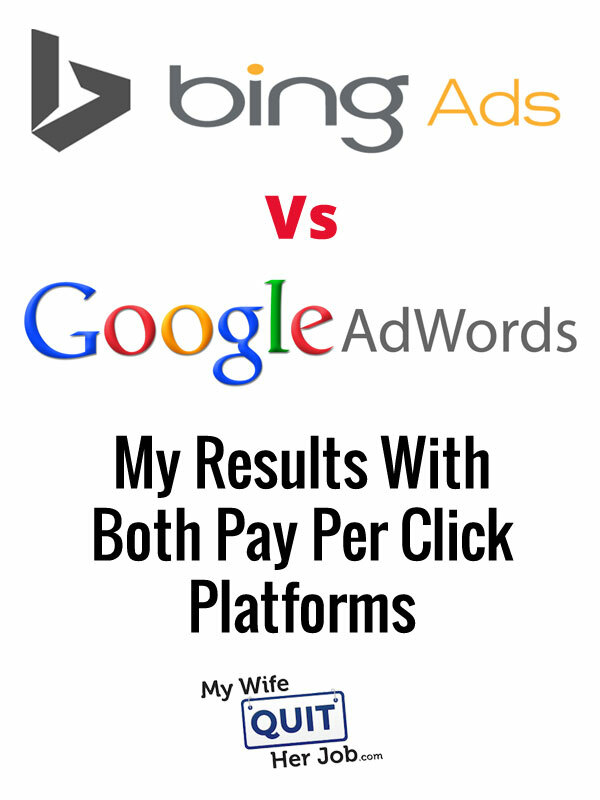 For example, Wordstream claims that their customers average 33.5% cheaper CPCs on Bing than Adwords. Bing ads typically yield significantly less traffic (more than 50% less). Meanwhile, here are my results with Bing compared to Adwords. Note: This data is based on only a single campaign. Right now, I’m running a lot more campaigns on Google than Bing as I ease myself onto the platform. To keep things as apples to apples as possible, I conducted these experiments with an identical campaign that was imported from Adwords. I also ran my Bing ads for several weeks to allow them to settle in before comparing the conversion data. Please note however, that I did have to adjust the bids slightly with Bing in order to place my ads into the same approximate positions as my Google Adwords ads which have all had long established quality scores. Here’s a high level summary of my results. Note: These results are only for Bing search ads. I’m still compiling data for Bing Product Ads Vs Google Shopping. Overall, I’m extremely pleased with my results with Bing Ads simply because they provide my online store with yet another untapped revenue source that is super profitable. Even though my results were atypical of what other people have seen with their ads, the Bing ads platform works extremely well. And because the user interface is identical to Adwords, the learning curve is really low. I was a bit surprised that the conversion rate on Bing was lower than Google for an identical ad set. But I attribute this fact to the differing nature of users on Google versus Bing. Note: I have other products that are converting better on Bing than on Adwords but I did not mention them in this post because the traffic levels for these products were too low on Bing to draw any meaningful conclusions. As a result, your mileage will vary depending on what you sell. But the moral of the story here is to never discount any source of sales just because you don’t get much organic traffic from a platform. If you are not using Bing ads, then you are probably throwing money down the drain. I don’t use microsoft products— they’re generally clunky and other tools work better. But you’re convincing me otherwise here! I never would have thought to try Bing. I do paid search as my job and one pro tip I’d recommend to anyone that scales their campaign from Adwords to Bing Ads is to consider turning off Syndicated Search Network partners. Bing Ads ‘search partners’ network is full of low-quality, spamy partners that are not policed by Bing Ads good enough. As a result, your conversion numbers could be a large portion of spam conversions by partners providing fake conversions. Given, I don’t know what your conversion definition is. If it’s conversions defined as completed cart checkouts, then great. But you still might want to run Reports > Website URL (publisher) report to see ‘Website URL’s that are not ‘Bing and Yahoo! Search Properties’ and pivot that data to analyze where the percentage of conversions are coming from. Bing Ads as a platform has gotten a lot better – and I’m their harshest critic. how do you get started with add without going bust first? Its easy for you guys, you have lots of experience. No-one shows you how. Great article. Thanks for showing the possible mistakes and how to miss avoid them. How many things in life are we missing out on because we just haven’t taken the steps that someone told us to do a long time ago?? Steve! your report is just too helpful for me 🙂 I was just waiting for one of those reports, and now I am going to test Bing Ads myself. Using negative keyword lists is especially important for AdWords. I’m considering branching out to Bing for ads as well. It’s all about the ROI and conversion rates, even if a CPC is high, to ensure the campaign is sustainable. This is interesting. Do you have a tutorial on how to use Bing for ads or is it just like AdWords? I really love working on bing. For both ads and organic traffic. Google seems messy to me. i do not like adsense it notthink ..
can you give me same tips ?